The topic of creeping is one I have been looking forward to writing about for a long time. Personally it is one of my favorite aspects of AoEIII because one can excel at creeping unlike in some other areas. To start lets consider the most basic aspect that being what treasures one should go for. There are the obvious ones such as unguarded treasures, but then we start to get a little more complicated. You have your explorer going around the map scouting and you uncover a treasure.At first, of course, you should see what it contains. Is it worth taking the time killing the guardians around that treasure or would it be better for you to find another treasure to capture. Similarly look at your explorer's health. One should think of their explorer's health early on as a resource. Make sure you spend this resource to attain the maximum advantage. Also, make sure you consider your locale to the enemies? exploratory units and base when you think about the health left on your explorer. As we will cover in greater depth a little later, in the first age, it can be a tremendous advantage for one to kill the enemies? explorer. Not only does it prevent the enemy from using the explorer but it also gives you 45 experience. You might be able to kill the treasure you are looking at, and it might be worth it to get the resources, but would doing so put your explorer in jeopardy of being killed later on by your opponent wherein it would help your opponent more than it would help you. With these different determinates there is not a firm yes or no answer on whether one should go for a treasure. Instead, you need to examine each treasure and look at all the variables. Your explorer might die from your enemy, but maybe that 240 wood you will get will be worth it. Think of all of these factors in a holistic sense and then make your decisions. The final aspect which one should think about is what is guarding the treasure that you are looking at. I know this is very basic, but I still want to touch on it. Make sure your explorer is not going to surely die if you engage the guardians. Ok, so now we know how to decide which treasures to go for, but remember how I sad explorer health should be thought of as a resource? Well let us now look at how we can conserve the health through some micromanagement techniques. To begin as you probably know guardians work so that if fired upon they will run to attack their attacker. Around the treasure they are guarding there is an invisible circle, which if they run out of, they immediately are healed and which forces them to run back towards their treasure. If after hitting this barrier they are fired upon, they go off in a different direction and then stop, waiting a few seconds before they run to kill their attacker. So let us say there is a treasure guarded by three coyotes that we want to get. We could just have our explorer attack them and he may win, but he is certainly going to loose an awful lot of health. Conversely, using the fact that the guardians retreat to their treasure, one can kill all of the coyotes without losing much health. Look at the treasure and find the coyote that is most separated from the rest. Using your explorer in ranged mode, you can then fire at him once. That means all the coyotes will start towards your explorer. Right after firing start your explorer moving away from the treasure. Mentally take note of how long until your explorer will be ready to fire once again, and when he has reloaded, have him fire one more shot on the coyote. By this time, the coyotes will be getting close, so once again start moving away. Just about as you are on that invisible line they will be on you, so have your explorer do one hack with his sword and move over that line. You will now have killed one coyote and lost almost no health. In addition, if you do it right you can put your explorer right on the line so that all but the one coyote you are attacking will retreat. This however takes a lot of practice but it is worth it. So, we have taken one coyote down and we have two to go. For the next kill, what you want to do is shoot one of the coyotes as they run away. As I said above this will stun him for enough time to allow you to get your second shot off, after which he will once again start towards you and at which time you can kill him with one sword swing. In the mean time the last remaining coyote will have gone to the treasure and he will be back to nip at your heels. Simply move out of the circle and repeat to kill the final coyote. I know this might sound hard to do but it takes practice. Eventually you will get to the point that you know exactly where that invisible circle is. In addition, while I have never tried this, it might be worth practicing on treasure hunting either in the scenario editor or via the sandbox computer if you are having a lot of trouble. As the saying goes ?practice makes perfect.? Next up let me give you a few advanced tricks you can fool around with when hit and running. Some of these are very hard to do well, in fact, I have a hard time doing them on a regular basis, so do not get upset if you also have a hard time, just remember the more explorer health you can save the better. For the first tip lets just say you are trying to bump and run against a wolf. Wolves are the same as coyotes just they take three ranged shots and one melee in order to kill. This presents a problem since you can only stay in ranged mode for two shots before they will close upon you. Try this, hit and run just as with the coyotes, however when he starts to attack you hit him with your sword once and then with precision timing wait until he is rearing back to bite you. Just as he does this retreat your explorer. He will bite you once but then you can get a quick shot off from ranged mode to kill him. It takes good timing but it can be done with many animals, such as bears. The next tip is similar to the first but it is a lot easier. Instead of attacking the wolf on your side of the treasure, attack the one on the opposite side. 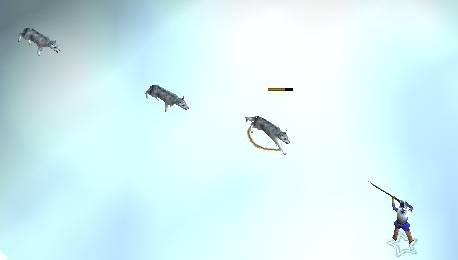 Now his pathing will be messed up as the other wolves are closer to you, and you will be able to get off three ranged attacks. Of course, you will lose a tad bit more of health since the other wolves will get to you faster, but that is a payoff for getting the treasure. The third tip is another hard one but it relies on the same pathing concept. You can do this with units such as a scout or a war dog but it is best to do with sheep. As your explorer is attacking a guardian, have the sheep get in between the guardian and your explorer. This will give you a movable shield to prevent them from attacking you. 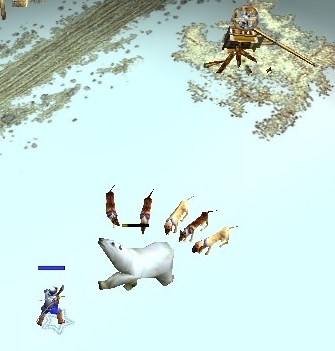 Of course, this only works against melee guardians but perhaps one could even totally surround his explorer with sheep and kill even the biggest melee guardian. I have not tried the total surround but it is something one could fool around with if they got enough sheep. One more little trick one can use to kill guardians more effectively is to use the surrounding terrain. Trees, rocks, trade posts and the like all make the guardians run father before they can attack you. The map, New England, is a perfect example of this. On that map there are stonewalls which are perfect for hiding your explorer behind. Simply utilize these natural features to your benefit and you will kill more guardians more effectively. Earlier I mentioned how some guardians are ranged and up until now, we have been working with melee guardians. The fact about most ranged guardians is unlike their melee counterparts they really can do a lot of damage to you fast. Two outlaw gunmen will mow you down. Many of the times, these guys have great treasures that they protect. Let us say you want to kill a blow gunner guardian. Normally your explorer will loose about 75% health from one of them. The trick is to put your explorer into melee mode and then attack. With this method, you will loose about 25% of your explorer's health, much more acceptable losses. Of course often you will find these units in pairs and therefore if you attack, one will be forced to melee while the other will be free to kill you from range once again. This is where the sniper kill your explorer has comes into play. Simple switch your explorer to melee mode, go right next to the guardian you want to attack, sniper the one that is a little ways off and melee kill the one right next to you. Now you got yourself a good treasure without loosing your explorer. I mentioned the sniper that your explorer has so let us look a little into when one should use this. Of course, you can use it in the way I just mentioned, but let us say you are attacking an alligator pit, or a bunch off wolves. Use it to reduce them just enough that you will not loose that terribly much health while you hit and run the others. It is a very good idea to use it on units such as the jaguar, for as I will talk about in a minute this guy really cannot be hit and run. Do not use it with coyotes, for you could kill 100 coyotes with one explorer if you wanted, and using a sniper on them is just being lazy. One final method of using the sniper is in attacking treasures that are heavy guarded and normally one would not be able to kill, for instance, sniper one guardian, and then run away. Repeat this method until the number of treasure guardians is weak enough for your explorer to take on with normal means. Whatever you do make sure your enemy does not notice and steal your treasure while you are doing this. Lets move on a little bit and look at each of the treasure guardians in the game and how one should interact with them. While I believe all of the following to be correct, when I wrote it I did not look up the health of each unit specifically so bare with me if I misquote on units statistics. I did this portion from memory. Being the most basic treasure guardian the coyote is the easiest to kill. Two shots from range and a lone slash with the sword is all you need to do to take down any number of these guys. Do not use the sniper on them. Doing so is lazy. Instead hit and run to kill them. The wolf is a step up from the coyote, taking three ranged shots and one melee swipe to kill. You can take on an awful lot of these guys if you micro but I tend to not recommend going at more than three at a time. They take a while to kill and normally their treasure is not the greatest. If you need to it is all right to use the sniper on these guys but there are certainly better guardians to use it on. These guys are nasty little buggers at about the strength of a wolf. Do not go at more than two of these guys at once. Just like with the wolf it is not a sin to use a sniper on these guys but there are better targets. Do not step-shoot these guys, they are fast, and so it will not work. Being stronger than a cougar, these guys are very nasty. Only attack one of them at a time, and certainly use your sniper if you can. One of these will put your hero's health in the yellow so be careful! Also just like with the cougar, you cannot step-shoot these guys. Approximately equal to the cougar in strength, crocodiles can be a little difficult to take down. However, unlike with the cougar you can step shoot vs. them. You can take on groups of three or so if you micro, but you will lose a bit by the way of health. Be careful, because due to the fact that these guys take so long to kill, they are a perfect target for enemy explorers looking to treasure steal. The black bear is interesting. Being the weakest of the bears, you can take on about three of them at once. Hit and run against them and try to get right on the edge of the invisible circle, so you can retreat if needed. Defiantly one I would not hesitate to sniper and remember to use step and shoot. These bears are a step up from the black bear and therefore hitting and running against them does not work that well. To top it off these guys are normally in large groups. I tend to sniper these guardians because most of the time if you try to engage these guys you will lose your explorer. Being the largest of the bears these guys look a lot worse then they really are. While their health is extremely high, their attack is, conversely, very low. Still only, attack one of these guys at once .To get a treasure guarded by two of them simply sniper one and melee the other. One general point I would like to make about guardians, whom you cannot hit and run versus, is that normally you can fire at them, retreat out of their circle, and once they turn back to the treasure, then you can fire once again. While it might be tempting to just click and let the explorer and guardian fight it out, you can save precious health if you do one round like this. Blow gunners are quite interesting. If you attack one of them at range, you are going to approximately loose 75% of your health, obviously not worth it. However, if you attack them in melee you only loose somewhere in the area of 25% health. If you can get two of these guys right next to each other, so they are both attacking you in melee you normally can kill both of them, just be careful though, it can be quite hard. I tend to only attack one at a time. Use the sniper if there is a group of 2-3 Blow gunners, and melee the remaining. I have grouped these guardians together because they are basically the same. The Bandit and Pisterlor are slightly stronger then the Rider, however they all are a force to be reckoned with. Never engage for than one of these guys at once and never engage even one of them at range. All three are great at range yet when in melee mode they are quite easy to take down, similar to the blow gunner. Therefore if you do attack one of these guardians who is by himself make sure you switch to melee mode. If for instance there are two bandits go up close to one of them, switch to melee mode, sniper the one farthest away from you, and melee kill the other. These guys are normally the best to sniper. Ok, well I saved the pirate for last simply because it is the strongest of all guardians. Just leave these guys alone. Sometimes I will slowly sniper them to death, or I will use a large army against them, but do not make it to high of a priority to kill these ones; go for smaller treasures first. One last topic that was mentioned earlier was explorer combat. I said that you have to be careful with your explorer so that you do not lose him. Conversely, one can use their explorer offensively in an attempt to kill the enemy?s explorer; this is explorer combat. The two methods to do this are the active and passive methods. One can actively seek out their enemy?s explorer by sending theirs toward the enemy?s base where they believe their enemies will be creeping. Alternatively, one can passively use their explorer by waiting for an opportune moment when by chance they find their enemies explorer. Most likely, at this time the enemy?s explorer will have a bit of health lost due to creeping. Run up towards him with your explorer in melee mode and then have your explorer chase him down across the map. Do not engage him at range because if you do that he will simply be able to run away from you. In melee mode, your explorer slows down his speed, allowing you to kill him. Similarly, one can also steal a treasure that your enemy is trying to get. To do this keep an eye on the fog until you notice some guardians being attacked through it. Run your explorer over near the treasure, sniper if needed the remaining guardian, and take the treasure. If when you get to the treasure your enemy is still killing the guardian, try to take a pock-shot at the guardian. If you time it right you will get some free experience on top of the treasure. This stealing also aggravates your opponent to no end, possibly throwing off his game. If this happens to you make sure you do not lose your cool.